Change up your pies this Thanksgiving, it will be good for your eyes! Try something new this Thanksgiving and change your pie option to Strawberry Rhubarb Pie. Not only will it be delicious but it will benefit your eyes too! Strawberries help you "C" better! 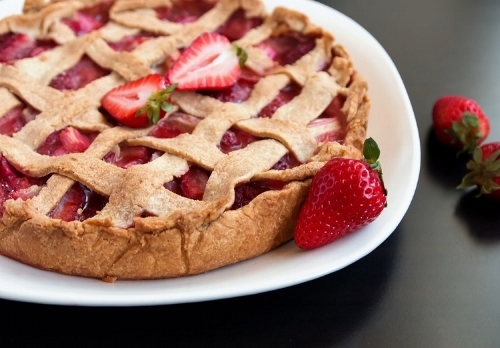 Below is a great recipe for Strawberry Rhubarb Pie. There are some links included too for some other great variations. In a large bowl, combine the berries, rhubarb, sugars, lemon salt and tapioca flour. Pour the filling into the bottom crust. Dot with butter pieces. Roll out the top crust into a 12 inch circle, and either proceed with a lattice top, or a simple double crust. Seal the edges and crimp decoratively as desired. Brush the crust with the heavy cream and sprinkle with raw sugar. Bake for 20 minutes at 400 and then reduce temp to 350 for another 25 minutes or until the crust is golden and the filling is bubbly. Let pie cool for several hours before cutting, the filling will only thicken as it cools. (hard to be patient I know.) The pie can also be baked the night before serving.